I am so excited! 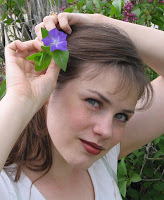 I don't know how I scored an exclusive interview with my new favorite author Aprilynne Pike! I asked her and she said YES!! Her debut novel, WINGS, has been out only a few months and has already hit #1 on the NY Times Best Selling List!! HOW LUCKY ARE WE?! Sweet Bookshelf: I'm squealing with delight! Thank you so much for agreeing to this interview. Thank you!! OK, let's get started! First things first, I'm a HUGE fan! How did you come up with the idea for WINGS? SB: Tell us a bit about you and your family. AP: I am a mom with an incredible husband and three young children. My husband is a recent graduate of law school and while he is preparing to take the bar, he is also playing stay at home dad so that I can keep working on the Wings series! SB: What prompted you to become a writer? SB: I'm in love with Tamani, what more can you tell us about him? AP: Um, that he will be back in book two??? :) Tamani is much deeper than meets the eye. We are really going to get to know him better in the second book. Some basic info that doesn't really play a big part in the book: he is five eight, weighs about 160 pounds (he's on the slim side), and is 21 years old. He has been a sentry since he was fifteen. The rest you'll have to wait and find out! SB: Will Mr. Barnes, the evil troll, be making another appearance? SB: What book are you reading now? AP: Honesty? What I always tell writers is to read. Not only read, but read, read, READ! I believe that you learn more about writing by reading than any other single thing. And after that, just write! Just do it! You will never be "ready" to write your novel; you just do it anyway. SB: What can you tell us about the 2nd novel? SB: Congrats on the film rights being acquired by Disney! I think Miley Cyrus will be a great Laurel. If you had your way, what stars would play David and Tamani? SB: What's the best part about becoming a published author? AP: Correcting people when they have asked me what I do for a living, and I say "I'm an author," and they say, "No, I mean, what is your job?" :D Because really, I have the best job in the whole world!! SB: Is there anything else you'd like to share with The Sweet Bookshelf readers? SB: My hubby wants you to know he bought the book for me. Will you sign my book? PLEASE?!?! AP: Of course!!! How did you want to do it? Thank you so much for taking the time with me to do this interview Aprilynne! We wish you all he best, and can't wait till your next books!! Thank you!! Great interview! Looks like a good book too. I was thinking about asking a couple authors if they'll do interviews when they're new books come out... hopefully they'll be as willing! Fun interview! Can't wait to read the book, now. So....um....I'm a fan of David. Awesome interview. i can't wait 2 read wings. i like the UK cover better.